The Mona Lisa, the world's most famous painting, should be brought back home to Italy from France, Italy's far-right Deputy Prime Minister Matteo Salvini said on Wednesday, before clarifying he was joking. His comments come as French-Italian relations have nosedived following a series of rows over illegal immigration, domestic policies and personal attacks directed at French President Emmanuel Macron. "I announce that we're working with the French ambassador to take back the Mona Lisa," Salvini said at a press conference to announce events commemorating 500 years since the death of the artist and inventor Leonardo da Vinci. "It would be more convenient for everyone who wants to see her up close," said Salvini, who is also interior minister. "Joking apart, obviously, we don't need more international crises." Da Vinci was born in the Medici-ruled Republic of Florence in 1452 but died in France in 1519. Salvini said he would visit Da Vinci's Last Supper fresco in Milan before May 2, the date of the Renaissance polymath's death. 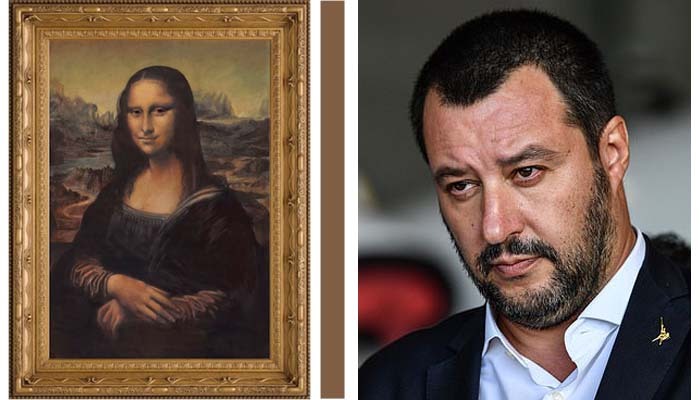 "As for the Mona Lisa, as long as she is in Paris, that will take a bit longer," Salvini said. The painting, whose mysterious smile has long captivated artists and admirers, draws millions of people to the Louvre museum in the French capital each year. France and Italy's relationship has soured since Salvini and populist leader Luigi Di Maio formed a government in June. The two governments have clashed on a variety of issues, including the Lyon-Turin train line, migrants and the loan of art works for this year's Da Vinci events. France in February recalled its ambassador after a series of "outrageous" statements by Italian officials. On Wednesday the Italian government presented a wide-ranging schedule for celebrations to mark da Vinci's death over the next year. "It's a holiday that will last all year and it's an opportunity for Italy to celebrate a genius, a genius that is ours, universally appreciated, so much so that the celebrations will take place around the world" said Prime Minister Giuseppe Conte. Dozens of events are planned until April 2020. A major exhibition dedicated to da Vinci's scientific genius opened on Wednesday at the Scuderie del Quirinale palace in Rome, entitled "La scienza prima della scienza" (the science before science).